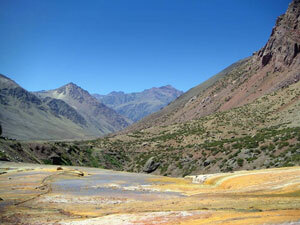 The Rio Mendoza, or Mendoza River, was muddy and resembled chocolate milk that rushed over sharp stones and rounded boulders. (Billboard ads for Nesquik even showed the milk-loving bunny surfing down the chocolate river.) Like the bunny, I rafted down Rio Mendoza, trapped in a boat with a group of women who would scream with every wave and then wipe the water from their wide eyes, exhilarated, as if they had just survived a hurricane. Cold water flowed down my wetsuit but was instantly warmed by my heart-pumping body heat. I’ve always loved white-water rafting trips, not only for the thrill but also because the guides are, almost without exception, the most laidback people in the town. They’re unfailingly good humored: for example, in one rafting trip I took with Ellen, the guide teased us by making us lean a certain way that made our boat flip, even though he knew one of the women with us couldn’t swim. He just pulled us back into the raft, the brave non-swimmer first, laughing hysterically at our dog-paddling and looks of shock. 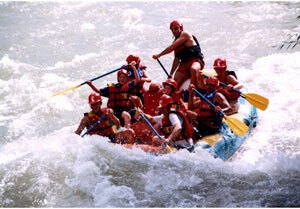 On the Rio Mendoza, however, there was less dawdling in between rapids and more rowing furiously to get through them. The intended day-long rafting excursion was cut short due to threatening skies, but our guide made sure we got our fill of adrenaline rushes. Later that day, to make up for the shortened rafting trip, I teamed up with a woman from Wisconsin for a riverboarding trip down the same rapids. We, along with a guide and the guide’s friend, suited up with wetsuits and helmets and flippers and gripped a thick boogie board as we entered the river. There was a five-minute lecture, trying to teach us how to right the board if it flipped over so we were not dragged through the rapids upside-down under the water, but other than that we had no idea what to expect. We all went down face first, trying to steer the unwieldy board over the waves and past the rocks. The flippers were way too big for my small feet and the guide had tied them to my ankles with rope, but they still slipped off at inopportune moments and dragged behind me, slapping against the waves. I swallowed a liter of muddy water with each wave that smacked me in the face and my chest heaved, trying to avoid an asthma attack. After the first couple of rapids I finally let myself go completely. I knew there was a possibility I could smash into a rock or get sucked under a hollowed-out boulder, but I just let the river take me. By the end, our guide had a swollen bloody lip, the Wisconsin woman was in near-hysterics, and the other man had to walk his broken board back to the camp. I stood up on shore, feeling the bruises develop on my shins. The other rafting guides laughed as I gasped “Otra vez!” Again! The ride home from Rio Mendoza I sat with the guides, the Wisconsin woman, and a couple of Brazilians. The music was loud and the guides occasionally directed chicken noises toward the guy who had to walk his board back from riverboarding. Someone sprayed shaving cream on a sleeping guy’s head and face. Everyone was tired and satisfied and slightly drunk from the booze they had passed around to numb everyone’s sore muscles while the driver sang along to Argentine rock music playing in the background. This page rendered in 0.27 seconds.